Welcome first time visitors. Share this announcement about CTMF 2019 with others. Visit the agenda showing the speakers. Follow these links to learn more about the workshops and receptions. Space is limited* Registration may close early. It did in 2018 and 2017. You do not have to register to attend the conference to register for any of five workshops and or three receptions. 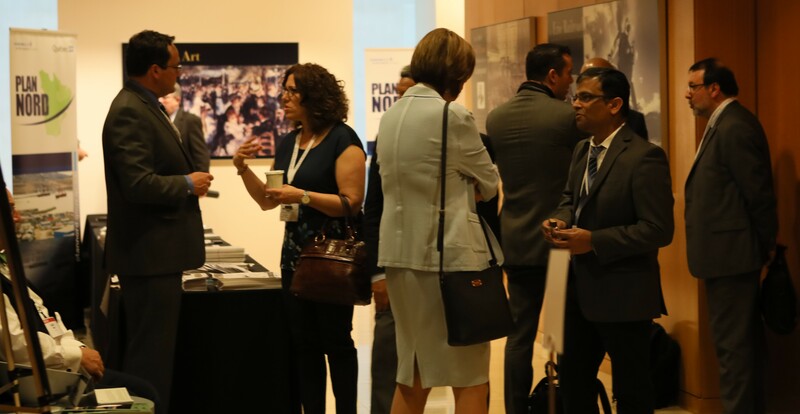 Throughout CTMF 2019 there will be time to meet and talk one-on-one with many influential banking, finance industry executives and advisers working all around the world. Look at the growing roster of firms atop the agenda showing a list of firms that will be there in three categories: banking, finance, investor, private equity firms; and mining and exploration firms and professional advisory firms. Sunday April 28, 2019 from 5 to 7 PM - Join all for lite snacks, hors d'oeuvres and beverages. Everyone needsto register and pay in advance to attend the Sunday reception, except for those registered to attend the Sunday workshops. There is no cost to attend the reception for registered Sunday workshop delegates (visit receptions) The fee is US$45 per person. Conference delegate registration fee includes breakfast, lunch, and refreshment breaks on Monday April 29 and Tuesday April 30 at Shearman & Sterling's conference facilities at 599 Lexington Ave, at corner of 53rd St. The delegate registration fee also includes the Monday reception at the New York Marriott and Tuesday reception at Shearman & Sterling. The fee for Conference Delegates is US$650. All need to register in advance. Spouses and guests are welcome to register separately to attend the Monday and Tuesday receptions. Speakers' registration fee includes breakfast, lunch, refreshment breaks on Monday April 29 and Tuesday April 30 at Shearman & Sterling's conference facilities at 599 Lexington Ave, at corner of 53rd St. The registration fee for Speakers is US$275. It includes the Monday and Tuesday receptions. Spouses and guests are welcome to attend the receptions. Join all for delicious hors d'oeuvres and beverages at the New York Marriott East Side Hotel.There is no cost to attend the reception for registered delegates and speakers. All others, including spouses and guests need to register for US$50 per person. Join all for delicious hors d'oeuvres and beverages and Photo Raffle. People not attending the conference need to register and pay in advance to attend the Tuesday evening reception. There is no additional cost to conference delegates and speakers (visit receptions) The Tuesday reception will be at Shearman & Sterling at 599 Lexington Ave, at corner of 53rd Street. The Rate is US$45 per person for all guests. Spouses are welcome. You are welcome to register more than one person. (for a description of the session and speakers' bios visit workshops) at Shearman & Sterling 599 Lexington Ave. The fee is US$300 per person. It includes breakfast, lunch, and refreshment break. (for a description and the presenter's bio visit workshops) at Shearman & Sterling 599 Lexington Ave, at corner of 53rd St.
led by Leslie Watson, Watson Environmental; James McMahon, CEO of The Climate Service; Don Marleau, Natural Resources Sector Lead, S&P Global Ratings; and Michael Ferguson, Director U.S. Energy Infrastructure Group, S&P Global Ratings. (visit workshops) at Shearman & Sterling 599 Lexington Ave, at corner of 53rd St. The fee is US$300 per person includes lunch and refreshment break. ** FAQ has details about cancellations, substitutions, and registration possibly closing early. Space is limited. at Shearman & Sterling LLP at 599 Lexington Avenue, at the corner of 53rd Street. Register to attend any of three receptions with hors d'oeuvres and beverages. Registration to attend the receptions on Monday and Tuesday is included with conference registration. If you plan to arrive early and want to attend the Sunday reception, you must register to attend the Sunday reception - as space is limited to the first 100 people registered. If you are registering to attend a Sunday workshop - your work shop registration includes the Sunday evening reception. If you want to just attend a reception please register in advance via the link above. You are able to register more than one person for the receptions. Spouses and guests are welcome. Shown below is a photo from a reception. We welcome you to join us. All must register in advance. Meet your colleagues in New York! The workshops will be classroom-style sessions led by experts in their fields with plenty of time for participation and Q&A. The instructors are working and addressing key issues daily around the world. Food and refreshment breaks are included with your registration. Read the descriptions here and the bios of the instructors There are no walk-ins. Two workshops are on Sunday, April 28 at New York Marriott East Side Hotel from noon to 4:30 PM that includes lunch, a refreshment break and invitation to the Sunday reception from 5 to 7 PM. Three workshops on Wednesday, May 1 at Shearman & Sterling LLP. Two workshops are from 8 AM to 1 PM: include breakfast, a refreshment break and lunch. A third workshop includes lunch at Noon, starts at 12:30, and a refreshment break and ends at 4 PM. Workshop registration fees per person are $300 per person. All must register to attend in advance. You do not have to attend the conference to register for the workshops. Read more about the workshops here. 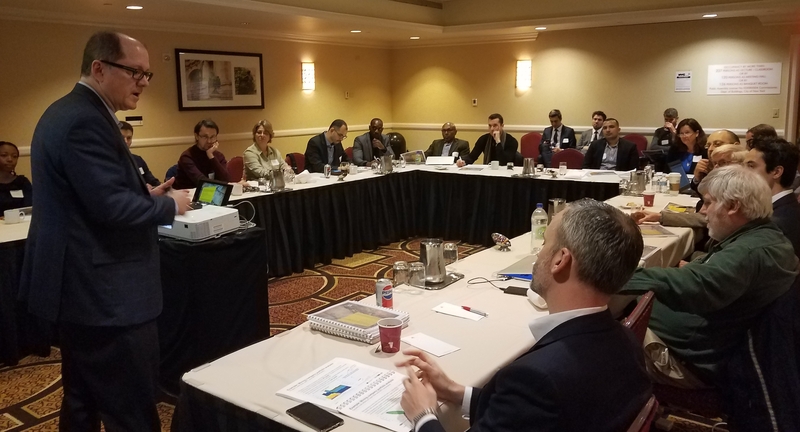 Workshop I: Mine to Mill Reconciliation and Assessment of Productivity of a Mining Project over its Life: Importance of Post Investment Reviews Led by Abani Samal, PhD, CPG, Principal, GeoGlobal, LLC and Peter Christensen, Principal, RESPEC on Sunday April 28. Meet at noon for lunch; workshop starts at 12:30, with refreshment Break. It ends at 4:30 PM at New York Marriott East Side Hotel. Workshop II. Political Risk - Recognizing Its Impact on Mining Operations, Corporate Strategy and Investment Decision-Making Led by Michael Samis, PhD, P.Eng, Principal, SCM Decisions and team on Sunday April 28. Meet at Noon for lunch, with refreshment break that ends at 4:30 PM at the New York Marriott East Side Hotel at 535 Lexington Avenue at the corner of 49th Street. Workshop III. Are you ready? A Comprehensive Approach to Navigate the U.S. Securities and Exchange Commission’s New Mining Property Disclosure Requirements Led by Ben Parsons, Principal Geologist, SRK Consulting (U.S.), Inc. and team on Wednesday May 1. Breakfast starts at 8 AM. Workshop starts at 8:30 AM with refreshment break. Workshop ends at 11:45 AM, plus lunch that ends at 1 PM at Shearman & Sterling LLP offices at 599 Lexington Ave, at corner of 53rd Street. Workshop IV. Valuing Mineral Assets & Operations – Understanding Valuation Issues. Led by Alan Stagg, PG, CMA, President, Principal Economic Geologist, Stagg Resource Consultants. Wednesday May 1, 2019 Breakfast starts at 8 AM. Workshop starts at 8:30 AM with refreshment break. It ends at 11:45 AM with lunch ends 1 PM at Shearman & Sterling LLP at 599 Lexington Ave, at 53rd St.
Workshop V. Measuring Climate Risk to Mining and Infrastructure Projects. Led by Leslie Watson, Watson Environmental; James McMahon, CEO of The Climate Service; Donald Marleau, Natural Resources Sector Lead, S&P Global Ratings; Michael Ferguson, Director U.S. Energy Infrastructure Group, S&P Global Ratings and Susan McGeachie, Global Director, Climate Change and Sustainable Development at Hatch. It is on Wednesday May 1 includes lunch at Noon; workshop starts at 12:30 PM with a refreshment break. It ends at 4 PM and is at Shearman & Sterling offices at 599 Lexington Ave. Join us for lunch promptly before Noon. 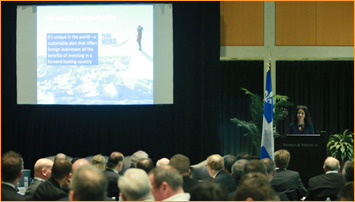 Shown below is Quebec's Minister of Economy, Science and Innovation also responsible for Digital Strategy, Dominique Anglade - a Key Note speaker at CTMF 2017 and CTMF 2016 discussing Quebec - A Premier Global Center of Mining, Technology and Innovation and highlighting its innovative partnerships with many leading mining and technology companies. NY SME thanks Minister Anglade, the New York office of the Government of Quebec for its support and the participation by Quebec's delegation of mining companies. Schedule and content may change. CMTF 2019 will be in the same venues shown in photos in this site. Hotel suggestions are here Thank you sponsors To join them contact Tim Alch, Co Chair at timalch@gmail.com. *Space is limited. The organizers monitor registrations periodically and may need to close registration early as occurred in 2018 and 2017. Some registered delegates may need to be present in a second board conference room that will have live video and audio feed to the main conference or conference room G/H and or attend in a third board room to watch and hear via live audio/video feed. Additional rooms and space adjacent to the main conference room are places to relax, network, meet one-on-one, for quiet phone conversations, or work. * * FAQ has details about cancellations, substitutions and registration possibly closing early. No refunds after March 31, 2019. A $30 processing fee will be assessed on substitutions. Attendees must register in advance of all CTMF events. We hope you join us!